Woohoo, flickr is now supporting videos… sweet! I just stumbled on the news and am trying to give it a test for myself to prove that its actually true. Unfortunately my Shozu (mobile uploading app) is totally whacked ever since I upgrade to the latest version (nice!) but no worries, I can still upload via my Notebook. Some items of interest about flickr video. Obviously a Pro account is suggested as that removes any upload restrictions on size. Also, videos are restricted to 90 seconds max. so keep that in mind. Some more details from Flickr… Video on Flickr grew out of the idea of “long photos” and as such, we’ve implemented what might seem like an arbitrary limit of playing back the first 90 seconds of a video. 90 seconds? Individual video files must be smaller than 150MB in size. See www.flickr.com and check out the FAQ. I’m now going to trying hitting m.flickr.com and upload a clip from my N95 via WiFi… hang on! Ok, my test from the N95 is having issues as I need to re-install a couple of things, however, I did manage to upload an old video clip from my notebook. Nothing too exciting, but see below for a video montage I created from some pics I took in Paris in 2003. Can’t wait to build out my Flickr Video gallery! Oh, like YouTube, there’s also an embed option where you simply grab some code and paste into your blog. 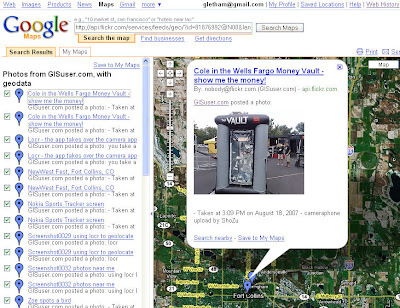 Take your Geolocated photos into Google Maps via Geo-RSS with ease! 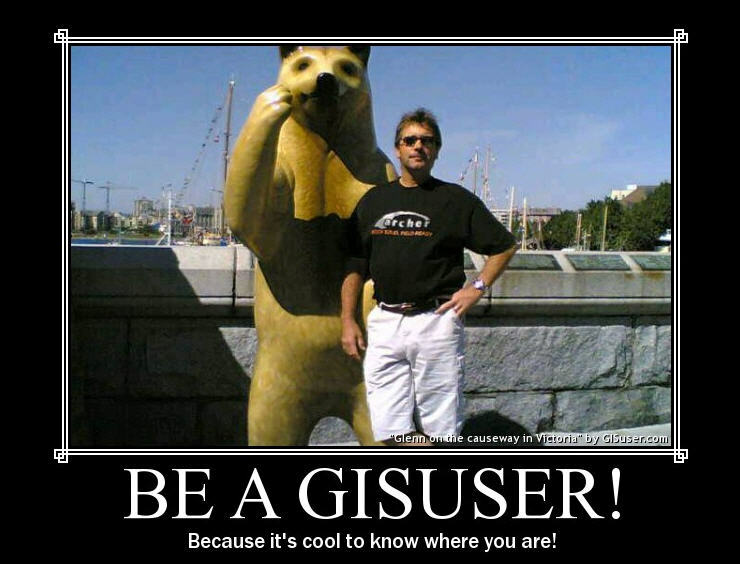 This may be old-school for some of you, others will appreciate this simple tip. 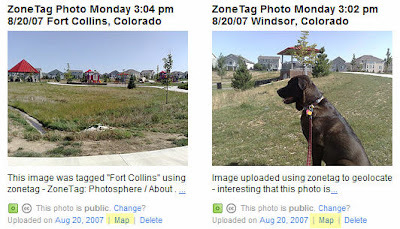 If you use a GPS-enabled cameraphone (like the Nokia N95, N82, Nokia Navigator etc…) then you can easily post your photos to flickr or other online services (use a tool like Shozu to help with this). But did you know that Flickr creates a Geo-rSS feed from your photo stream? Even better, you can simply copy and paste your Geo-RSS feed location into the google maps search bar and voila… your photos are now available via Google maps to share with others, save to your mymaps or whatever the heck you want to do. Simply look at the bottom of your flickr page, you’ll see options like RSS, GeoFeed and KML – yes you can easily open your photos in Google Earth too! See my stream in Gmaps here. Wow, just stumbled onto an awesome flickr slideshow tool… you know that I’m a flickr fanatic, however, I didn’t know about this app so I hope you enjoy as much as I do… this one will be really handy so be sure to bookmark this post! FlickrSlidr allows users to easily and quickly embed a flickr slideshow into your website(or blog). Alter the size, the flickr set to display, and then mess with the speed. 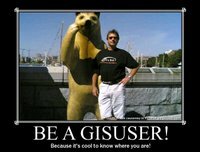 See below for a slideshow of my 2007 ESRI User Conference photos.. enjoy! ok… more on the geotagging photos sent to flickr via shozu and my Nokia N95 GPS-enabled smartphone. I’ve recently been doing some research to figure out exactly how to geotag my photos, and get them up on flickr then view on a map. From the outside looking it one would think, “no problemmo”, however, things are not often as simple as they would seem. Luckily there’s a couple of good third party apps that work very well. Those of you that depend on out of the box functionality that wil accomplish this will have to try again! – there’s much confusion out there about this. – many people seem to be having trouble with many different aspects of this. – some people seem to be experiencing difficulties uploading via shozu from the Nokia N95 – I have yet to see any issues with this. – apparently you can tag photos from N95 directly with GPS coords if you run sprt tracker or load the maps application – I’ve yet to be able to accomplish this seemingly simple task. Enter Yahoo! Research labs zonetag and locr. Zonetag from Yahoo! has just recently come out with a version that supports Symbian S60 3rd edition devices (Nokia N80, N95, 6110 etc…). The application is very simple to use and it works. Simply install zonetag, setup your preferences (I’m still tweaking these) load the app, connect the GPS to grab your fix, take a photo, upload to flickr… it’s as simple as that! 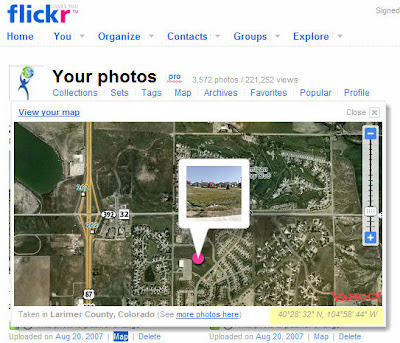 Once on flickr your photos will have a hyperlink to map the photo and the coordinates will display when you view the photo on a map. So far I’ve had excellent results with this application. Locr (www.locr.com) operates in a similar manner. 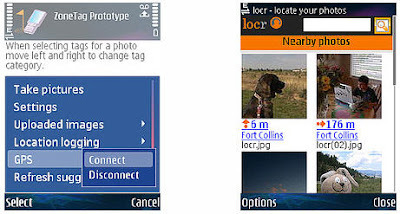 Install the app, setup an account, connect to GPS to get a fix, snap a photo, upload to flickr and to locr if you wish. Your photos are maintained in a locr account and from the mobile device you can also view your photos or photos that are near you. Once feature I’m not big on is that the application takes over the camera and you don’t seem to get the full functionality from your device. This contrasts with Zonetag where you use the camera in the same mode that you normally would with your device. Please note, you should have an all you can eat data plan to use these applications otherwise the results (and your next phone bill) could be scary! I use shozu for uploads normall, however, it seems that when using zonetag or locr you are actually bypassing the shozu functionality… I’m not worried as I can use al teh data I want. Stay tuned for more on these apps. Overall, I give locr a 3.5 out of 5, zonetag gets 4.5 out of 5! The photo appears exactly where I took it on the map! The motivator – create your own Geospatial motivational prints! In the “slightly off-topic” category… More fun stuff for those of you that enjoy flickr as much as I do. this fun app enables you to create a slick motivational poster to hang on the wall, use in a presentation or what have you. Motivator enables a user to quickly and easily point to a flickr photo or upload an image to the server. then you simply enter a catchy title, a catch phrase and create a frame. Then you can save, print, or upload to flickr… fun and likely some useful applications, particulalry for you geospatial evangelists… have fun with this one. See Motivator here, see my motivational poster here.